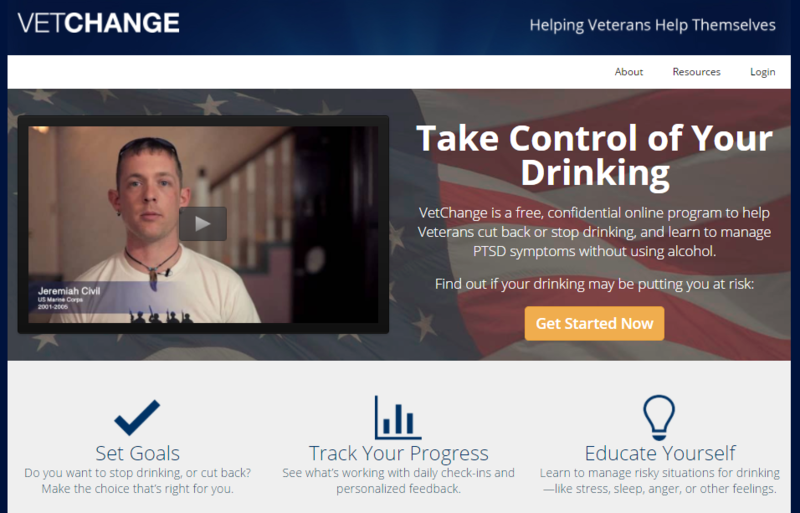 VetChange is a mobile and web-based self-management program intended to help active duty military personnel and Veterans build skills to better manage their drinking. The program starts with self-assessment questionnaires which are intended to help users understand more about the risks and problems associated with their drinking and some of the factors that may be affecting their drinking. After each questionnaire, users receive feedback which could guide them in making decisions about their drinking habits. The “Make a Decision to Change” section contains texts and videos meant to answer remaining frequently asked questions. Next, users complete a text based section to decide whether reducing/stopping drinking is right for them. Finally, users can work through three (text and video) modules intended to help them identify events and situations that trigger their drinking, develop action plans to manage those in a way that helps them meet their goals, and enhance their knowledge about common problems faced by active duty military personnel and Veterans. VetChange also provides users with an interactive dashboard which allows them to set new goals, track their drinking, and check in on their progress. The app has a 15 min countdown clock to assist when urges occur (program states that an urge typically passes after 15 min). The developers suggest users to try a different strategy to cope with their drinking every week and revise their action plans until users find the strategy that works best for them. Free/ focus on veterans’ challenges/ good tracker in the mobile app. VetChange is a program suitable for veterans who want to control their drinking habits. Its main advantage is its availability and its focus on veterans’ challenges (e.g., PTSD). However, VetChange could also benefit non-veteran individuals. The mobile app is convenient and could be useful as a drink tracker, allowing quick, on-the-spot updates of the number of drinks consumed. The countdown clock is a good tool for managing real-time cravings. However, as an informational /goal-setting tool, the web-based program is more convenient. Therefore, some people might find that combining the mobile and website versions makes the best use of VetChange. Overall, although the content is professional and clear in both the mobile app and the web version, the program is not very engaging. Its main delivery method is through text, while additional videos, audios, and animations are lacking. Without sufficient features to encourage and engage the user to use the program and its tools, VetChange is mostly suitable as a supplement to ongoing treatment. VetChange could be suitable as a supplement to treatment mostly for veterans dealing with problem drinking. The program can be used “as is” between therapy sessions, with the therapist playing the role of a supporter throughout the process. For more severe cases, it is recommended that the program be used alongside a treatment plan that specifically targets this issue. In this context, the program would serve mainly as an informational tool and tracker (app).